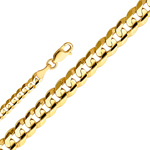 This unique 14k gold 5mm cuban concave chain measures 5 mm in width and weighs approximately 15.0 grams. 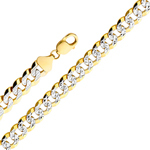 This unique 14k gold 5mm white pave cuban chain measures 5 mm in width and weighs approximately 15.0 grams. 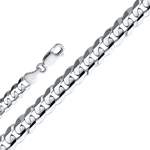 This unique 14k white gold 5mm cuban concave chain measures 5 mm in width and weighs approximately 15.0 grams. 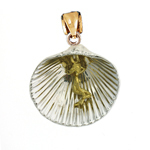 This 14k two tone gold mermaid in a shell pendant features a hollow back, it measures about 30 mm in width by 28 mm in height and weighs approximately 12.4 grams; it makes a remarkable addition to any fine necklace. For an unforgettable touch, this large round signet ring makes a handsome addition to those rugged hands. 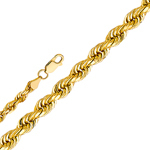 A wide band of smooth polished gold makes this large gold round signet ring come to life while adding a sense of accomplishment to any man's day.